A new exhibition of paintings from the Lebowski Cycle opens next week at the Flecker Gallery in Selden, New York. I am working to finish printing limited edition giclees of many of the paintings, which should be available soon. Catalogs from the show will also be available. Please check back or leave your email address in the comments section and I will email you with information when they are available. 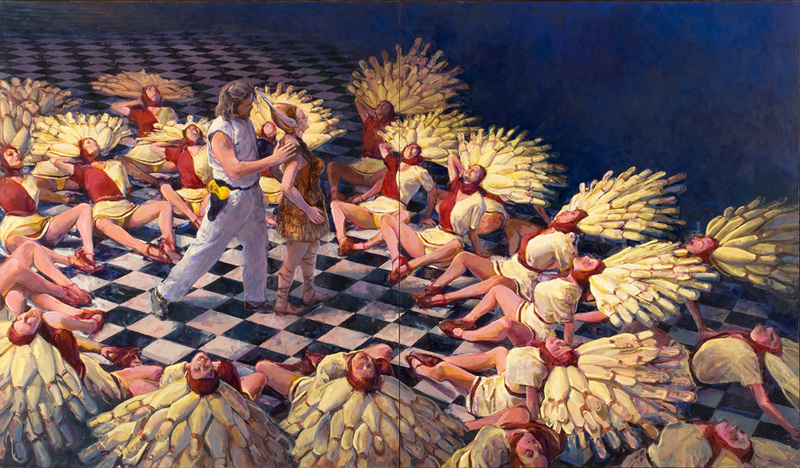 The Flecker Gallery is pleased to announce that it will host The Lebowski Cycle: Paintings by Joe Forkan from October 17 through December 02, 2013. An opening reception and gallery discussion will take place on Thursday, October 17 from 1:00 p.m. to 3:00 p.m. The event is open to the public and light refreshments will be served. This entry was posted in Exhibitions, Figurative Painting & Drawing, Lectures and Workshops, The Lebowski Cycle on October 11, 2013 by Joe Forkan. My wife and I are very interested in originals or LE prints of your Lebowski Cycle works. We live in Austin, TX and received your email about the exhibition starting this week, but we cannot attend due to location. I would love to receive any materials you can share electronically, such as an exhibition guide, as well as information about works available for purchase. Thanks! I would like to inquire about purchasing the first print of “Taking of Christ” for Jeff. Please let me know how to go about doing this. Please let me know when the prints will become available. They’re sublime! Thanks! The prints are available from the blog now.